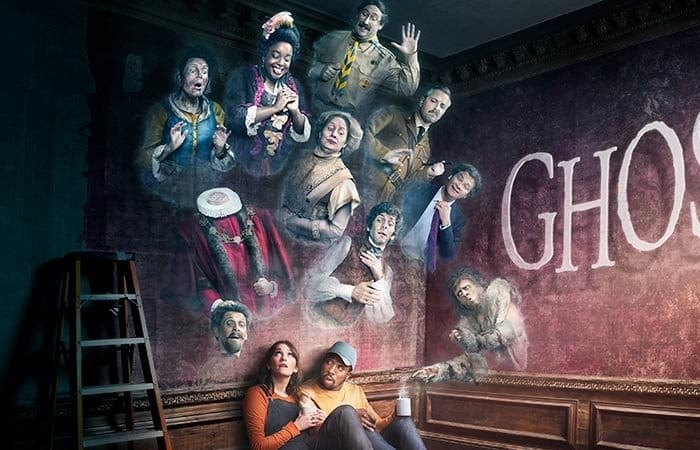 The BBC One comedy series Ghosts tells the story of the deceased occupants of Button Manor as their (after)life is turned upside down when a new resident, the very much alive Alison, takes ownership of their home. Lexhag VFX was brought on board to work closely with the creative team and bring all of the shows visual effects to life (excuse the pun!). Along with the standard cover-up/paint out work, Lexhag was also asked to take charge of producing some of the shows most memorable sequences. To create the ethereal effect of Lady Button transcending to heaven in EP01 Lexhag worked closely with the creative team to produce a range of concepts using SideFX’s Houdini. Once the idea was nailed down, bespoke particle simulations of the ‘ethereal plasma’ were generated for each shot which when comped in, produced a visually compelling sequence that formed the starting point of the whole series. A big part of Lexhag’s role on Ghosts was to produce the ‘wall walk’ effect of the Ghosts travelling through solid objects. Much like the ethereal plasma effect, several iterations were conceived before finally settling on the one seen in the series. As this effect was a big part of Lexhag’s shot roster, a bespoke pipeline was built to allow us to quickly and efficiently generate different versions of the same effect that fitted each shot. This a) allowed us to deliver the large amount of ‘wall walk’ shots the series required and b) meant that the effects matched in terms of continuity as they were built from the same elements. As a VFX project, Ghosts was an exceptional one for Lexhag as unlike most projects, the VFX was brought to the forefront of the story. Ghosts is also a great example of how visually compelling and narrative-driven VFX can be achieved through close cooperation between a production and a VFX studio.